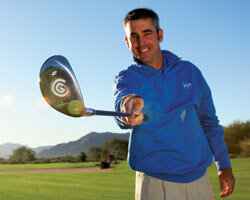 I found an interesting article at golftipsmag.com called 4 Ways to Score with a Hybrid. It's a good source for ideas on how to get more use from your hybrid. You'll also see plenty of tiny pictures scattered through the article. Click on them and they "blow up" so you can see more details. There's a lot of good info here on how ball position affects these shots, which is often the most important (and least often considered) detail when setting up to play a specialized shot. The photo came from the hybrid article.